This is a definite crowd-pleaser cocktail sauce! Experiment until you achieve the best flavors for your personal taste. Adjust to taste and serve with fish. Idea for serving: Mix with medium or large shrimp for a delicious shrimp cocktail garnished with lemon wedges and little cilantro or parsley. 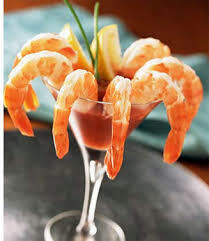 Try serving shrimp in a pretty glass bowl fitted inside another glass bowl that is filled with crushed ice or small ice cubes for a lovely presentation.